Doris I. 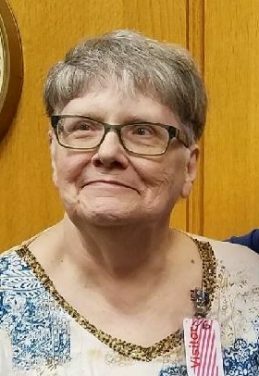 (Sleek) Moudy, 69, of Frankfort, passed away on Tuesday, January 1, 2019 in her home. She was born on April 22, 1949 in Moran, Ind. To Clarence A. and Marie L. (Hansen) Sleek. She married Terry Moudy in 1967 and they later divorced. Doris was a lifelong Clinton County resident and 1967 graduate of Rossville High School. She worked for Sonoco-Crellin in Frankfort for 33 years and for Tech Group of Indiana for 7 years before her retirement. She loved to Crochet and was a member of the Crochet group at the Frankfort Library. Memorial donations may be made in Doris’s honor to the Frankfort Parks Department with envelopes available at the funeral home. A memorial visitation is being held 2-4 p.m. Sunday, January 6, 2019 at Archer-Weston Funeral & Cremation Center, 501 East Clinton Street, Frankfort. Surviving are her Sons: Todd Moudy of Kingston, TN and Chris (Mary) Moudy of Frankfort; Grandchildren: Alisha, Heather, Lindsay, Jessica, Matthew, Max, and Chloe; 1 Great Grandchild; Brother: Russell (Doriene) Sleek of Salina, KS and her beloved dog: Rosie. So sad too lose a best friend. Our prayers to the family. She will be missed by so many. 65 years of friendship carries lots and lots of good memories. She was a Very Sweet Woman and Loved by many she will be Truely Missed. Such a good friend, for over 40 years…so patient with me, learning to crochet..
she will be so missed, left a dent in so many lives.. I am sadden to hear of Doris’s passing. She was my craft buddy. We shared the love of collecting what others called trash to turn it into something wonderful. I will miss her dearly. My thoughts and prayers to her family. Godspeed, Doris! Joel and I are so sadden to hear of your mom’s passing. Our thoughts and prayers are with you all. So sorry for your loss. I worked with Doris at Crellin… very nice lady. She will be remembered and missed. Todd,Chris and family : So sorry to hear about your mom. We worked together at the Cigar Factory a long time ago.. Sending prayers your way. I am so sorry to be reading this. She was a remarkable lady and so much fun to work with.